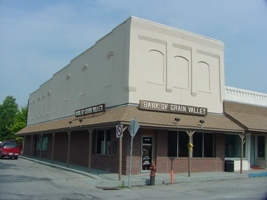 Formed from two smaller towns in 1878, Grain Valley has been a city rich with history. With the westward expansion of the United States and the purchase of the Louisiana Territory in 1803 by President Thomas Jefferson, this area was destined to be settled. The journey of Lewis and Clark through this area established Fort Point, which later became Fort Osage. This fort was established as a part of the U.S. factory system for the purpose of trading with Native Americans and pioneers in the area. The City itself was incorporated in 1945 and has certainly experienced many changes in recent years. The City continues to grow and change; and while we are always looking toward the future, we are reminded of the history that has brought us to where we are today.